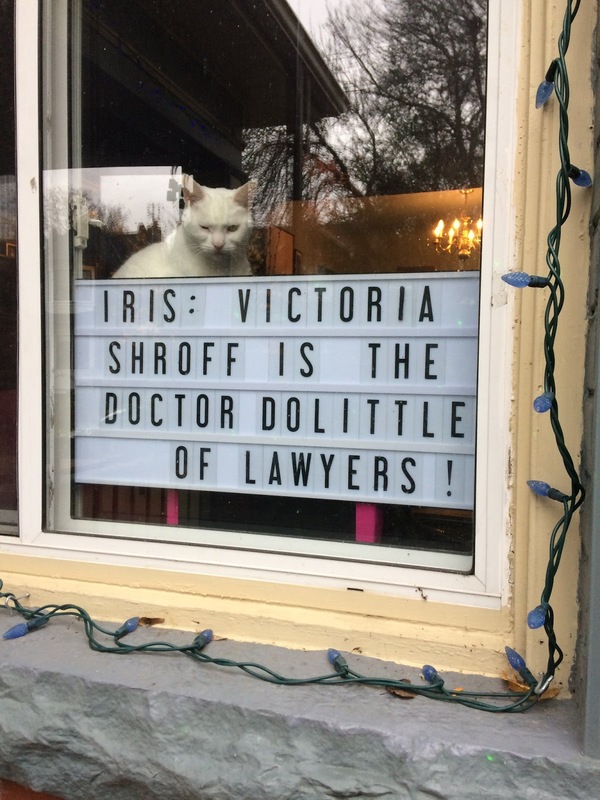 Except for the few weeks she took off from active duty in the summer, Iris the Cat messages have been appearing in our front window for almost 10 months. 8) A new sign every day? Really? No. Every two days more like. Three sometimes. Which is still way too often. 7) How does daylight saving time affect Iris' signs? Never thought you'd ask. What with full time jobs and very short winter days, getting a brightly lit photo is a crap shoot at best. We've actually called in outside help on occasion. If the government needs any more reason to get rid of daylight saving time, this is it. 6) Speaking of freelancers, does Iris accept other people's suggestions? You bet. But don't expect attribution There's no room on the sign. Plus I hope you're not surprised she steals. Iris is a cat. They're all master criminals. I believe so, but Victoria Shroff might disagree. She's an Iris fan and a real honest-to-goodness animal-law lawyer in Vancouver and if Iris ever sues us, she'll probably hire Victoria as her agent. Victoria likely thinks cats aren't felons. 4) How long do you think you'll be able to keep from making a felon/feline pun? 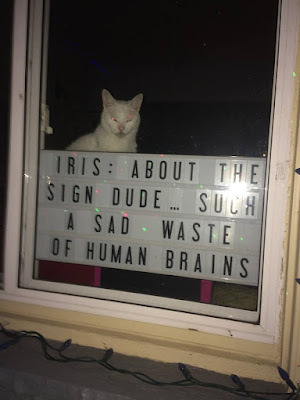 3) What's one of the most surprising responses you've gotten to an Iris sign? Ha! My sister Charlene said the following and I quote: "People love Iris because she's so pretty and wise." My own older sister called "Iris" wise! Reminds me of how people used to think that Charlie McCarthy was really funny. McCarthy. He was late ventriloquist Edgar Bergen's sidekick. And no, I never made the Charlene/Charlie link until right this minute. 1) Do you ever think you'll get tired of this immature word-play? 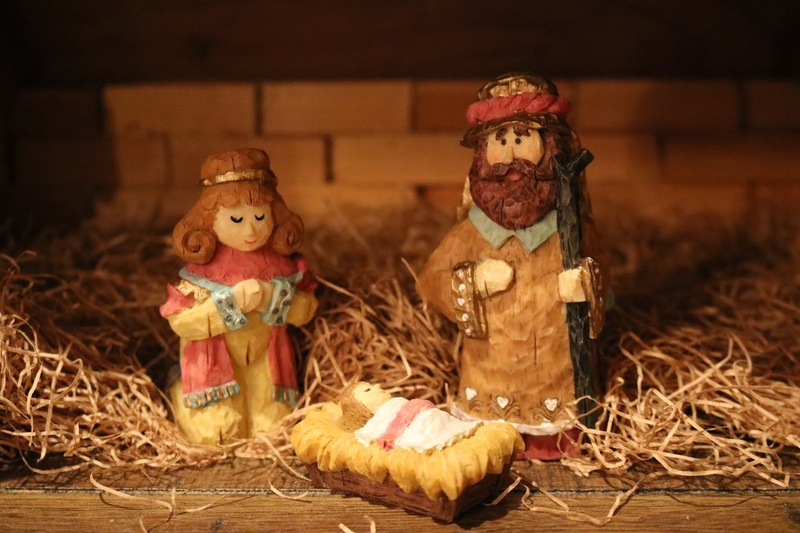 Hands up everyone who remembers what role you played in your grade-school Christmas pageant. You all do! Rather, we all do. Never mind that it was way more than 50 years ago, I still recall me dressing up as Saint Joseph and keeping watch over Baby Jesus. I remember the brown cloak I was wearing and how nervous I was. I also remember another really important part: And that is the little girl who played Mary. "Mary" had long dark hair and big brown eyes and I remember that when she visited our house before the pageant, my late mom Huena commented on her beautiful dark skin and "Mary" attributed it to a diet that included lots of olive oil. Or pasta. I forget which. But I still think those two food groups are good for your complexion. Yesterday, on my way to work, I heard a couple of local deejays toying with the idea that we all grow into the characters we played in the Christmas pageant, and I think they might be on to something. "Shepherds?" the female announcer said. "All of them are serious stoners." One of the guys on the show said he was jealous of his older brother who upstaged all the other kids because he played a dog in the stable and raced around the stage licking the other characters and lifting his leg to pee against the stable wall. Sounds inspired to me. When I got to work, I told my pal Richard about the deejays. Richard--and he's a few years older'n me--said that he had been Joseph in his pageant but things went off the rails early. Milliseconds before Richard delivered his one big line--"my wife is with child and we need a place to sleep," the joker playing the innkeeper leapt out from behind the door shouting "No room at the inn!" Joseph started giggling and couldn't stop for the rest of the show. I work alongside Richard every day. Pretty much all we do is try to make each other laugh. I've always had lots of time for St. Joseph. Here's a guy married to a beautiful woman; she has a Kid (upper-case K cuz it's Jesus) and even though Joe had nothing to do with the "making" of said Kid, if you catch my drift, he loves Mary and the child all the same and he's a good dad, trying to keep everybody happy while his wife and Kid make all the big decisions. You don't have to be a biblical scholar to know that his biggest moment is when he asks for a room at the inn and gets turned down. God knows we've all been there. You've been driving all day; everybody in the car wants to stop but the road is one no-vacancy sign after another so you power on, hopeful that around the next bend, something will be available and for some reason this is all your fault and you're thinking everybody in the car loathes your very soul. But I digress. In real life, I happen to know that Mary from my pageant left St. Albert's shortly after grade one then later in life went on to do some runway modeling and when I ran into her in mid-high school, it was almost as if she'd forgotten me. St. Joseph should be patron saint of the friend zone. So I ask. Did you grow up to be your character in the pageant? My son Michel did. He was Jesus. That fiddly thing in the picture? It's a viola da gamba. The photo was taken at 1:18 last Thursday afternooon, minutes after I--the world's worst bargainer--wheedled and dealed for the instrument with a tough-minded clerk in a pawnshop near my house. That--believe it or not my first bargained-for purchase--was what I was celebrating in the pub. And if that isn't a load of hogwash I don't know what is. I was going for a beer with my friend John O'Callaghan anyway; it just happened that I did the pawnshop deal first. John took this pic. But still. I did bargain for the instrument. Except not on my own behalf. The viola da gamba belongs to Teilhard Frost. Teilhard--one of the most colourful gentlemen on the planet--is a man you couldn't possibly do justice to in one single blog entry. When you're done reading my story, click here to get Teilhard's. Teilhard is also the Sheesham part of the travelling minstrel show Sheesham and Lotus & Son. I've known him since he was a kid and he's never asked me for anything, ever. I was at home goofing off when Teilhard Facebook messaged me to ask if I could visit a pawnshop a few blocks from my place. Teilhard, who lives about four hours from here in a boonies locale called Wolfe Island, had been in the store recently and had seen this viola da gamba but didn't have time to deal with it so asked if I could, you know, go down and pretend I knew how to dicker and buy the thing. So down to the pawnshop I went--taking texted instructions from Teilhard all the way. I actually asked him what I should do for openers. 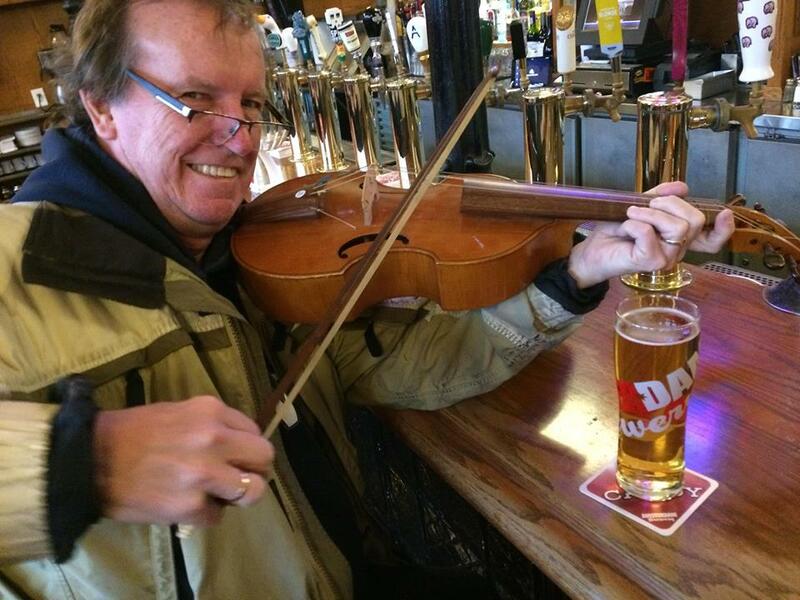 "What," I asked, "should my viola-da-gamba gambit be?" I asked if he had any tips. When they cooked up Carter DNA, they forgot to put in the bargaining gene. My wife Helena once told me I bargain up. "Look tough." Teilhard advised. "And disinterested. Lots of shoulder shrugging!" I entered the cluttered shop and found my way around to where the instrument was hanging. My first bid, from the woman serving me--got laughed at. I texted that fact to Teilhard. He said I should go higher. I asked a nearby panhandler if he'd had any experience with this store. He said they'd alway been fair with him. I made another offer. She wouldn't budge. I stood at the counter and wondered how I was supposed to act. Should I look broke? Or suspicious? I am not wired for this. I left. Talked to the panhandler some more. He lives near me. Texted Teilhard. He gave me permission to make another offer. The panhandler probably hadn't had such a good laugh in ages. Our fourth bid won! I was thrilled. And from among a blizzard of back-and-forth texting, here's one of Teilhard's messages: "I can use it in my educational program. I refer to them [violas da gamba] all the time I will now be able to actually demonstrate!! How exciting. Thanks so much for sweating through that!!! And sorry for all the exclamation marks." The pleasure, dear Teilhard, was all mine. Then he asked me if I'd measure it when I got home and I said "whattaya mean home? I'm going busking. If, that is, I can fight off the viola da gamba groupies." To which he replied "Good luck. They are very good at the art of disguise as people who don't care." Teilhard will take delivery of this treasure in the new year. Me, I learned a few lessons. And finally, even though I didn't write this blog only because it let me make the viola-da-gamba gambit pun, that's as good a reason as any.